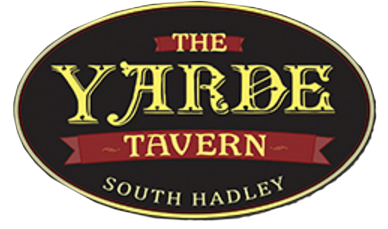 The Yarde Tavern in South Hadley | Best food in spirits in MA! All burgers are served with your choice of French fries or Tavern slaw. Our classic 8oz. beef burger, sliced tomato, lettuce, onion, sliced pickles and your choice of cheese. Served on a brioche. Cajun spiced 8oz. beef burger, roasted red peppers, crumbled bleu cheese, provolone cheese, sliced tomato, onion, lettuce and sliced pickles. Served on a brioche bun. Grilled maple glazed turkey burger topped with provolone cheese, bacon, cranberry mayo and fried onion straws. Served on a brioche bun.